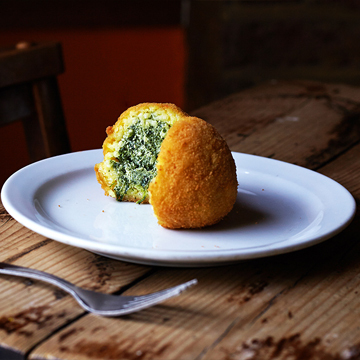 Following the original recipe from Palermo, these deep fried saffron risotto balls are becoming more and more popular by the day with our local Londoners. We named our rosticceria after this product and we hand make them with perfection, every day. 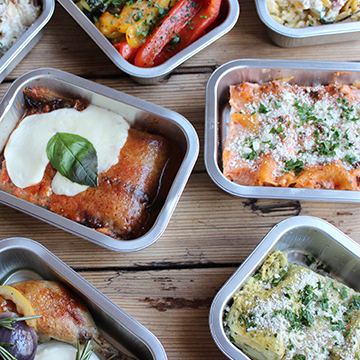 Choose from 4 fillings: 2 permanent resident flavours - Beef Ragu with peas or Ham & Cheese; plus 2 seasonal vegetarian options that change every couple of months. We also offer a similar Roman product, “the Roman Suppli” which is a deep fried ball of beef ragù risotto with a melted heart of mozzarella in the centre. Truly YUMMY! We constantly change the menu in order to offer a broad selection of other freshly made regional Italian dishes: beef or veggie lasagna; melanzane alla parmigiana and the infamous “Mimmo style” Cotoletta di Pollo (chicken milanese). Got room for dessert? We make those too :-) all strictly Italian! Tiramisu, Italian Gelato by GROM and our world famous Nutella pizza ring!!! Arancina pizzerias can be found in Rome and London and are loved for their particular style of artisan hand-stretched, hand-topped rectangular pizza – Pizza alla Pala. 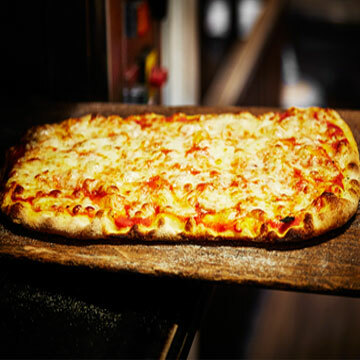 Made the Arancina way, to a secret recipe, with a blend of premium flours and extended fermentation time, this pizza – fired in a stone bake oven and served on a traditional wooden board - has a distinct crisp outer crust and a lighter, airy, textured bite. 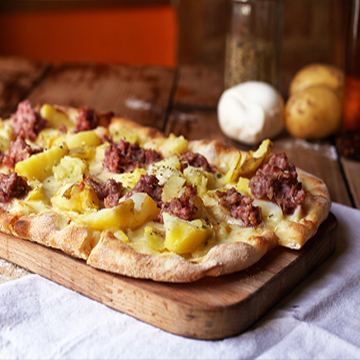 Get a whopping 70cm long pala to share; an individual Paletta© or just a slice, al Taglio. 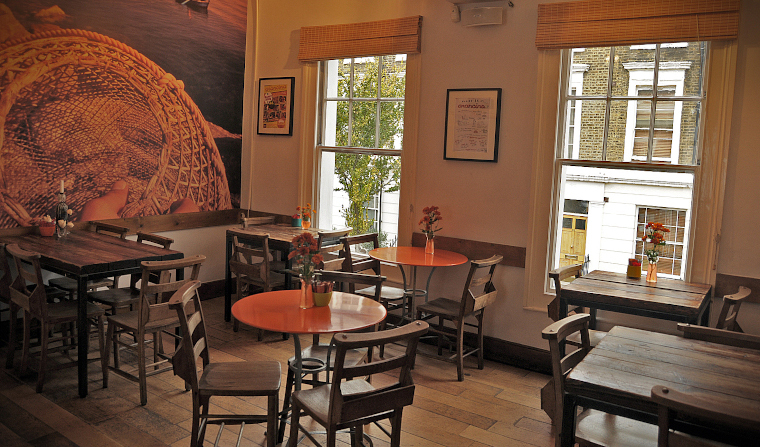 Beyond their moreish pizza, the rosticceria serves a broad variety of freshly made traditional regional dishes from Italy. 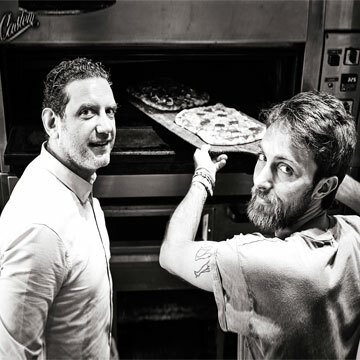 The privately owned chain counts 7 rosticcerias, first founded in 1996, was brought to London by Edoardo and Michele Mortari – brothers, both pizzaiolo and successful entrepreneurs with a passion for real Italian food. Rustic yet modern, the interiors of the Notting Hill and Boxpark Croydon branches blend earthy wood, aluminium and exposed bricks. Both are filled with quirky details not to mention half a remnant each of their five day car journey across Europe in their family owned Fiat Cinquecento which sits in two parts in the windows of the two London branches. Okay, so Porter’s not a make believe superhero. But with a built-in super-hot stone bake oven, this four-wheeler really does fire up the crispest, crunchiest real Arancina hand-made pizzas fresh, anywhere on the spot - which is in fact so much more impressive than leaping 20ft high. Follow Arancina’s Porter’s road trip adventures on twitter; it’ll be driving to festivals, events, markets and private parties across the UK and we wouldn’t want for you to miss it! 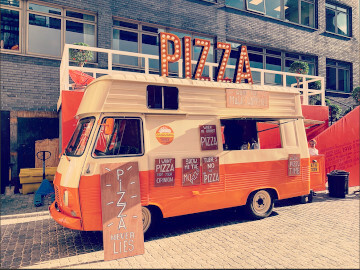 It’s little and it’s cool … and it’s available for private parties, weddings, markets and festivals – Piaggio Porter is our super fun mobile-pizza-oven that fires out the very best Roman crisp crust yummy Arancina Pizzas on the spot. To find out how we can cater to your needs, please send Edoardo an email – he’ll be happy to help you out. We’ve got many tricks up our cooking sleeves but no secrets to hide. We are very happy to chat about our food preparation and quality. Arancina is a fast casual pizzeria and tavola calda with no table service. If you would like to hear about the latest vacancies at Arancina, please feel free to send us your CV at job@arancina.co.uk or pop in and say hi.